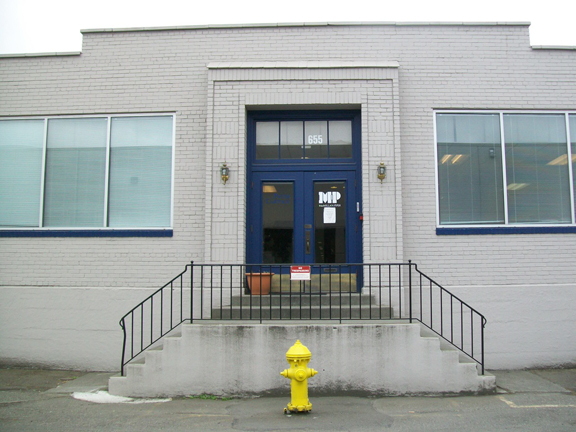 Summer 2011 Mystery Solved: I have pictures of the Seattle office factory. Now we know the location! If you have pictures or more information, please email me. Above pic found in one of the B&B publications. I suspect it may have been closer to 1904 as the third building was added sometime prior to 1949 and possibly prior to 1929. Above: Close up of the B&B building from the 1908 photograph to the right Above: Factories in the Georgetown district, Seattle. Janice from Edmonds Wa emailed me July 2012. Seems she uncovered this wonderful studio shot of the Seattle Factory She bought a nice picture frame at a garage sale. When she took it apart to add her own picture to the frame, this picture was undereath. What a great find. I am not sure if this was in the 1940s or 1950s. I know that the current building at 655 Edmonds Street was part of the 1930 construction project which was approx $100,000 at that time, so this picutre must have been taken after that. Studio stamp on the back side notes "ARTCRAFT STUDIOS SEATTLE 4, WASHINGTON 515 Third Avenue". I will send this image to Time Rose of MacPiper and see if he can add anything about the photo. Plus I wonder if Chuck knows any of these employees. I recognize a couple of the guys. 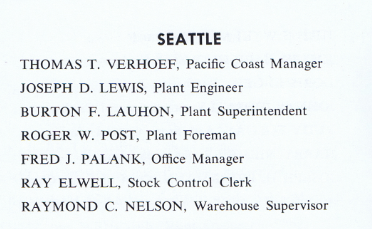 There were no girls working at the Seattle plant when I took over in 1955. Only one woman in the office, she was an Eskomo. My best guess is the photo was taken in the mid 40's. They were standing on the front steps in front of the office. I recognize the fellow front row far left. I can't remember his name. The fellow standing far right with the neck tie is Joe Lewis, Plant Superintendent. The fellow in the jacket and tie with his back to the office double doors is Ver Hoff, not sure of the spelling, he was a salesman. The bald headed fellow, right side 4 th row up, next to the guy in the striped shirt is Andy Jackson. He was the last Plant Manager prior to closing the plant in 1978. I have seen this picture before in one of the old Yellow Strand magazines. The girls would have been hired and worked in the factory durning the war. So that would put the photo in the mid 40's. The girls were all gone by 1955. This picture is a good find. It's definitely the building we are presently occupying. I took and have attached a photo taken this morning from about the same spot. As you can see not a lot has changed. The windows have been replaced & also the light fixtures on either side of the door, but other than that, it's still the same. The front door is original & the metal railing has stood the test of time. The photo is a great addition to your history package. August 10, 2011: Mystery Solved. But there are still questions. I was very blessed to have Karen Gorden (from seattle.gov) research for me, and she has found an old survey (labeled Dec 1949. I have superimposed the survey over the google image on the far white: in white below) which shows 3 B&B buildings. The two original left buildings with the railway between them were standing at one time (at Edwards & Stump street, later renamed Maynard, and even later paved over alltogether). 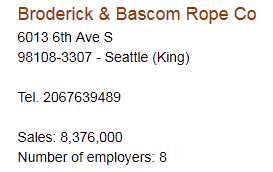 At the end of B&B's Seattle operation, prior to the sale, the official address was, and still remains 655 Edmunds. MacPiper operates from this space as of 2011. When I visited, I was able to meet with Tim Rose, who recalled the middle building torn down in 2005 (per Tim's email below). I assume Tim had not seen the earlier building on the far left as per the survey. I should ask. 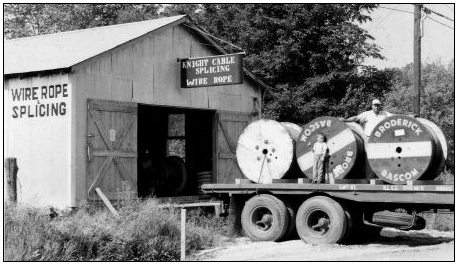 1930-B&B 4th largest wire rope company in the country. New building will have a spool room and sales offices. Building to be 230 feet by 80 feet of modern steel and concrete construction. 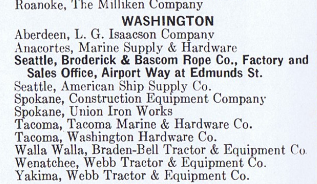 Seattle was the only "branch" as of 1930, while warehouses and sales offices are in all the principal cities of the US. A new $2,000,000 plant expansion as recently been completed in St Louis and a new warehouse has been completed in Portaland. Seattle plant has a payroll of $8,000 a month. Sixty people are employed. I had seen a publication online, and was not sure if I would win the bid. Days before my seattle trip I made a bid. During the trip, I realized I had won the bid and paid for the item. . A few days later, I checked my mailbox and it came. here is the pdf file. I was looking through quickly to see if there was anything interesting. Reading back to front, did not see anything that caught my eye util it hit me. Smack dab on the inside cover is the building I have been obsessed with for months. INCREDIBLE. I was so elated. 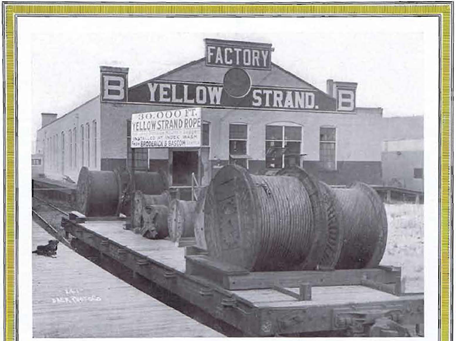 not only is this obviously the Seattle factory, but the 1914 picture shows how the rail line comes right up to the building, which matches the 1949 survey. It just feels like it was meant to be, and with as much effort as I have put into scanning all buildings in Georgetown WA from all different angles, it seems wonderful to finally find the building. But them upon my return home to get in the mail a picture of the exact building seems to me that there was some spiritual intervention. I find myself questioning if JJB was helping me. This is the middle of the three buildings shown in the 1949 survey. 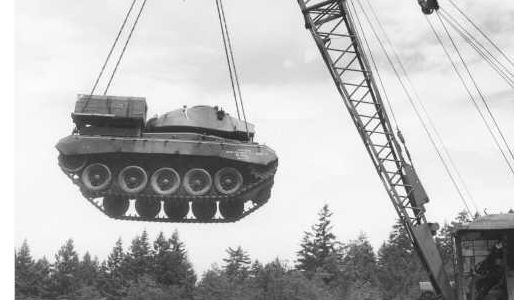 More info about the spools and where they are going. And dont forget to see the cutie dog on the left side of the pic. 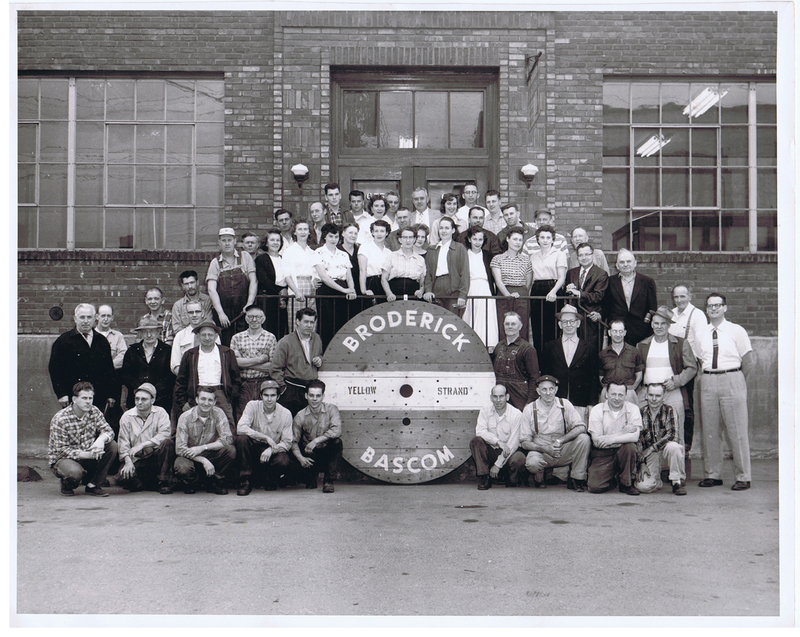 I have mostly completed my web page regarding the location of the Broderick and Bascom Rope Co building shown in the 1908 photo. I have to say, were it not for the both of you, I may not have ever found this building, and I most certainly would not have gotten the enjoyment out of this. As geneology is my hobby, I surely love to see the history as well. I enjoyed learning about Seattle in the process of finding this building. I was quite shocked to find in the 1949 survey from Karen that there were actually 3 buildings, not two as pictured in B&B publications. Fascinated, and assuming that the third building from the survery still stands,, I have superimposed the 1949 survey over the current google maps image. Indeed, the current building was standing in 1949. Tim is correct, and the middle building is the one he referred to that was torn down in 2005. Please visit my webpage to see my pictures. Thanks so much to both of you who were integral in this process for me. It was most certainly a strange question to ask for help, but because you are both so welcoming, I cannot tell you how exciting this discovery has been for me and my family. Thanks so much. Above shows the mystery solved. Below details the research involved, and more unanswered questions. Starting the oddessy - where is the seattle building? 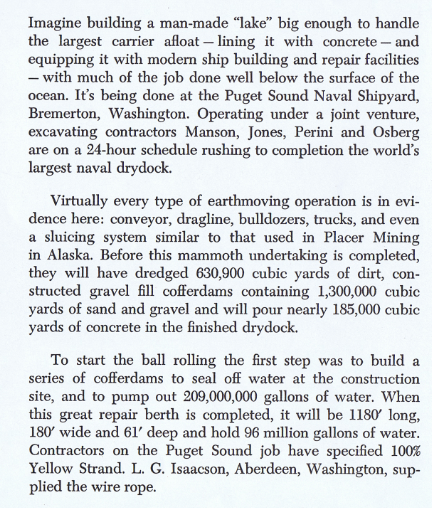 June 2011: Note the background image on this page is an old seattle watererfront image. Well after we went to San Francisco in 2010, I was bummed in tht I did not know that Broderick street was indeed named after Broderick & Bascom Rope Co, and that was the street where they coiled the wire. further, there was a cable car museum that I would have surely wanted to see if I knew there was a B&B spool of wire cable there. I found this true gem. It is a 1908 picture of the B&B factory in Seattle. I have spent hours trying to figure out where this is specifically, so I can go see it when I am there. So for this trip to Seattle, I would like find out where the B&B buildings are before we travel there. After hours of looking at google, I found the following in one of the things I scanned at Bryan Broderick's house. 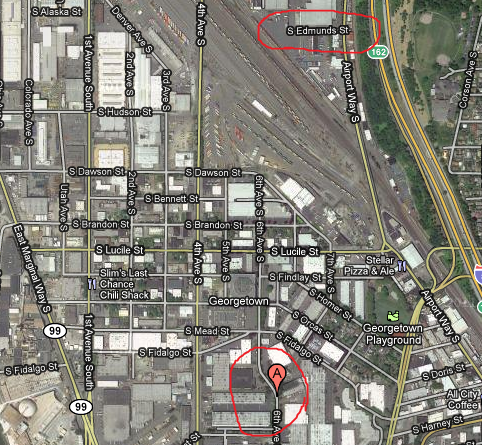 It clearly shows the address is Airport way at Edmunds, which is a very tiny street. I am hoping this can lead to finding the actual address. It stands to reason that Stump streed could have been renamed to Edmunds, as it is the smallest street in the area, but I have no confirmation of this. 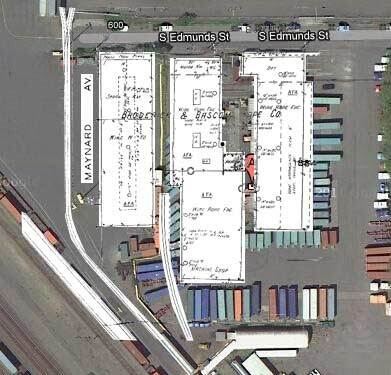 Map of actual plant and one of the old addresses, 6013 6th Avenue South, Seattle, WA (bottom of pic) also shows the Edmunds address. I am not sure what this location was, or why it is associated with B&B or Macwhyte. This picture below very much resembles the 1908 picture of the building. There is no reason to believe the address has changed over time. However, we do have the Edmonds St address, as well as the Google result of 6013 6th Avenue South, Seattle, WA. Being that the company has been sold, the 6013 6th avenue address could be the location of the purchaser, and not the location that B&B operated from. Because the phone number is no longer working, I have not confirmed this. I see there is also MacWhyte Co has that same address, so I may try to call them today. Not sure if they are still in business. Days before I left for Seattle, I received an email from Tim. My name is Tim Rose and I am the facility manager of this warehouse location. 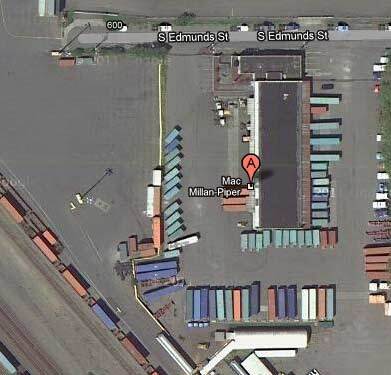 The building we are in is 655 South Edmunds Street and is presently owned & occupied by MacMillan-Piper, Inc. We are a transloading operation that handles import & export cargo. We load & unload overseas shipping containers. We expanded into this building & property in the mid 80's. We have operated our business on property directly to the south of this parcel since the early 70's. We acquired that property (4865 Airport Way South) from what was then the Burlington Northern Railroad and it was then known as the Agro Team Track. 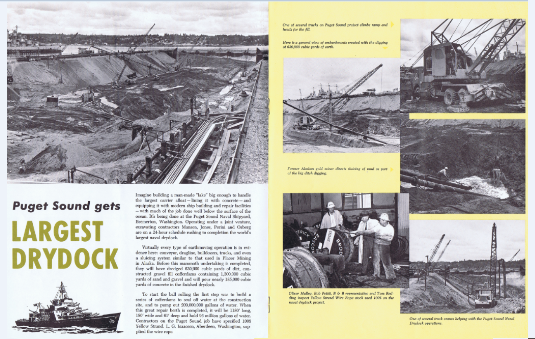 That signified a location that had rail tracks but was available to any party who had a rail shipment but did not have their own trackage and needed a common user location to load or unload their cargo from the rail car. We believe this building on Edmunds Street was built in the post war era and was designed as a small motor freight terminal. 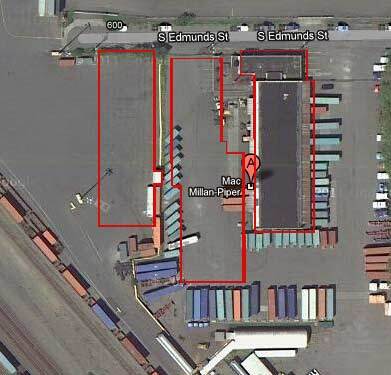 Prior to our purchasing this property & building it was occupied by a succession of different trucking companies. In regards to the Broderick & Bascom building on Edmunds Street, I regret to inform you that it is no longer. It was torn down about 2005. It sat directly to the west of our building & we rented & used it for storage for about 10 years up until the time the parcel was sold and the property redeveloped & the building torn down. It was a single story brick building with a single rail track that fronted the east side of the building. The reason I know it's name was because on the back or west side, which I believe was originally the front side when 6th Avenue used to extend farther south, you could faintly see painted across the top of the building "Broderick and Bascom Wire Rope". The photos you have attached do not look anything like the building on Edmunds street (they appear to be much larger buildings) so I'm guessing they might be pictures of the other location. If you do happen to end up in this area I would be happy to show where it once existed. Hope this helps with your investigation and please do not hesitate to contact me if I can be of any further help in your exploration. Just another business in Seattle area. Father and son shown on the truck with the spools.